This is part one of a multi-part guide intended to eventually cover all heroic 5-man encounters in Cataclysm. This installment deals with Blackrock Caverns and Throne of the Tides. Part Two covers The Stonecore, Vortex Pinnacle, and Grim Batol, and can be found here. The expansion has been out for nearly a month now. You could be anywhere from completely done with heroics to just getting your feet wet in them. This is not a strategy guide for every boss in all of the heroics. This is a mage specific guide for knowing what you can do as a mage to help ensure your party’s success. If you’re looking for a quick overview of each boss, these cheat sheets over at Sword and Board were written with a tank in mind but can be used by anyone. This will be a series in several parts, covering all of the Cataclysm heroics. This first installment has Blackrock Caverns and Throne of the Tides. Mages are in a fantastic place for this expansion. Yes, GC said they’re watching us to see if our damage needs buffs, but we’re far from abysmally low. More importantly, our CC is important again. Enjoy Ring of Frost before it gets nerfed! Bring out that Polymorph macro! Most importantly, I’ve noticed this expansion seems to have attracted a resurgence of mages. Our portals are incredibly useful, we help crowd-control, we bring cake – what’s not to like? Whether you’re a veteran or a reasonably new mage, remember that you’re an ambassador of our class. If you act like a jerk, people don’t think, “xXFrostFireXx is such a jerk,” they think, “Man, I keep running into so many jerkish mages!” Don’t be that guy, because it makes us all look bad! DBM is a must-have as far as I’m concerned, even for five-mans. (Or substitute your addon of choice, I’m sure DXE or Bigwigs/Littlewigs are fine. I just happen to use DBM). This will keep you informed about what a boss is doing, especially if you haven’t seen it before. Mage Nuggets is a great little addon I’d recommend for any mage. It gives you proc notifiers, a mana gem tracker and a few other little goodies. Most importantly, it lets you know when an enemy you are targeting has something that you can spellsteal. I’m making note of important ones in these guides, but you might miss them altogether without a notifier. It has the added benefit of giving you a polymorph bar when you have a target CCed. It counts down a timer so you can see at a glance when your polymorph is running out of time. This is useful for not just trash but also boss fights. Use it, love it! Combustion Helper is a fire mage specific addon. It’s invaluable and will help you get the most out of your Combustion. It serves the dual-function of helping you keep track of your DoTs all in one place. I use Omen (for boss fights) but I also use Tidy Plates and Threat Plates to easily see when a mob is starting to think, “Gosh, that one wearing magic-toilet paper and standing in the back looks pretty crunch-able.” Tidy Plates has the added bonus of automatically colouring a mob’s bar to match the CC target – so it’s easy to pick your grey sheep bar out of the pack. p.s. – Moon is sheep. If anyone disputes this, they’re just plain wrong. Regrettably, at the time of this writing the login servers are having trouble, and I can’t get in-game to access my macros, and I don’t want to write them again. I’ll add some macros to this space once I’m able. I wouldn’t want to give you something I’m not sure will work. I know, some of this goes without saying and I’m probably preaching to the choir. Much of the strategy for heroics also depends on your group – if you’re in a guild group where you trust the tank and the healer, feel free to unleash a bit more. You get to know your tank’s limits (both their skills, and their patience) and you can judge whether it’s safe to toss a scorch or a living bomb on a mob as it’s heading towards the tank – or whether this is an avenue towards certain death. When in doubt, play it safe. In a pug or with folks you don’t know really well it’s probably better not to do anything radical or unexpected – frequent wipes and corpse runs will lead to bitterness and can fracture a pug in short order. CC when you’re asked. If a pull is going poorly, pick a caster in the back and CC it anyway. It may get broken but for a few precious seconds it isn’t attacking the tank or healer and so that’s time well spent. weaving is also very useful here. A straight Scorch rotation costs nothing but is less DPS than Fireball ad infinitum. Alternate the two and throttle back if necessary. You want to be able to use your highest rotation in the burn phase and after Molten Fury kicks in. One more thing – Blast Wave dropping a Flamestrike on the ground slows and also costs less mana than a Flamestrike. I can’t speak to the other two specs because I’ve been pretty much all-fire all the time since starting my runs. For the same reason I can’t get my macros, I can’t arrange clever screenshots of each instance. 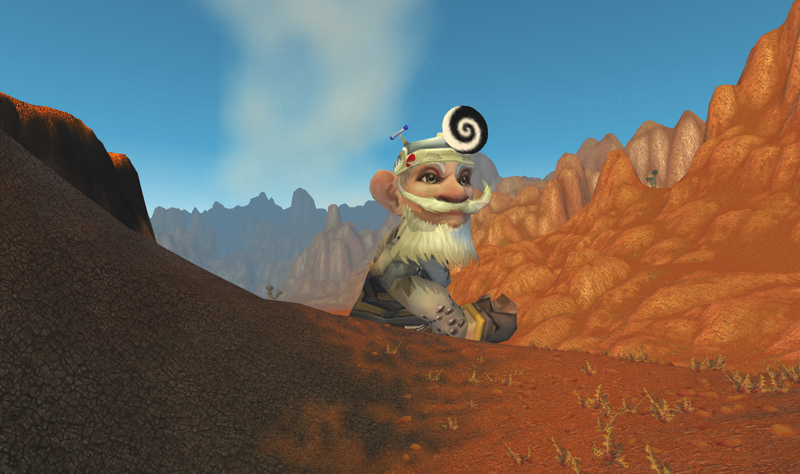 Please enjoy instead: a giant gnome. len for two minutes. If you time it right you can have that for pretty much her entire fight – there are several of these guys there so you can snag it more than once if you’re lucky. The most important thing this guy does is chain the party with targetable chains you’ll have to DPS down. Immediately after, he casts an AoE quake. I made a macro that I swap in for my assist macro just for this fight: something as simple as “/target chains” will do the trick. If you time it just so, you can use a Ring of Frost or a Frost Nova to lock his adds down near him. If timed correctly, he’ll kill them all himself. This is actually an achievement. Use Blink to GTFO after the chains have been broken. An excellent tip from a commenter Nina here – use Iceblock to clear at least one of your sets of debuffs to allow yourself more time DPSing the boss. Frost mages with Cold Snap can probably do this at least twice! Otherwise, be ready to cast Time Warp if it seems suitable or necessary, but I usually save it for the next fight. Trash: Use Ring of Frost or Frost Nova and have the tank drag the fire elemental add down the hallway. If you freeze the quicksilvers on the stairwell, they’ll deactivate and be no trouble. You will be expected to CC one of the puppies for this fight, it doesn’t matter which one. Be prepared to carefully watch yourPolymorph timer because if Sheep breaks, that angry, fire-breathing puppy is headed straight for you. Ask your tank to move Beauty far enough down the hallway to allow you to cast incidental AoE without worrying about breaking CC. Mirror Images won’t break CC, but Fire and Frostfire Orb are untrustworthy culprits. I use my Frost off-spec to trivialize the kiting task for this fight. A combination of Cone of Cold, Ice Barrier, Frost Nova, Ring of Frost and your Water Elemental’s freeze make these guys laughable. You can use Icelance to quickly grab their attention and pull them away from the group, especially after Obsidius switches places with one of them. If you keep them away from the group and never let your debuff stacks reach higher than three, you can snag an achievement here. A quick ice block will clear your stacks off if you need to reduce them, but of course the adds will immediately begin running away from you, so be ready to pick them back up. I avoid Mirror Images on this fight because they like to do things such as: attack the adds the other mage is trying to kite if I’m not the one doing it, or sprint clear across the room to aggro the trash we left up three kilometers away. I’d be wary of Frost/Frostfire orb for the same reason, mine was attacking the adds when I wasn’t the one kiting them, which could be avoided by making sure to put a good distance between you and the adds before casting it. Even if you aren’t Frost/don’t have a frost spec you can still kite through judicious use of slows (if Arcane) or well-placed Blast Waves and blinks. It’d be harder but doable. You can still use Icelance to quickly aggro any of them. For this fight if you’re tasked with the adds you aren’t really trying to do damage to them or the boss. It’s best if you’re able to focus on the task at hand. Nothing says friendship like telling your buddy he has a bit of squid stuck on his head. Trash: There are a few notable targets for spellsteal in this instance. The Tainted Sentries (purple water elemental guys) have an ability called Swell that you will want to steal. It does a whopping lot of shadow damage in a huge AoE range – that is the damage that your damage could be if you smelled like a mage. The corridor with all of the Gilgoblin packs is a bit annoying. If you’re asked to CC one of the goblins (and you should) be ready to polymorph immediately followed by an iceblock, because the other five or so gilgoblin hunters have some arrows with your name on ’em. The big guys further down the corridor here throw everyone up in the air and do an AoE quake-style thing. Remember that blinking will return you safely to the ground, so aim yourself away, blink and be ready to keep DPSing. You should be out of the quake’s AoE at that point. Maintain a safe distance from Naz’jar in order to have more time to see waterspouts coming. A quick blink can move you out of their range, but be careful not to blink into another one! Depending on the group you may be asked to Polymorph one of the caster adds she summons. We no longer do this, but instead our tank will tank the melee add and one caster add while we burn the other. Since they’re just casting, they won’t wander over and hit you in the face, and should die too quickly to do very much damage. Nothing really mage specific for this fight, you may blink to get out of a Dark Fissure quickly but you shouldn’t have to do very much here. If using Time Warp, I’d use it at the beginning to burn him ASAP. (Make sure to wait a little to let your tank get a threat lead, though. I hear they don’t like having to taunt within the first five seconds). When the squid casts Absorb Magic (DBM announces this) spellsteal it. It’ll heal you if you take any spell damage, and prevents him from being healed allowing your party to continue DPSing him. If you are the target for the Head Squid, you can Iceblock out of it successfully! There isn’t much mage-specific for this fight; be prepared to target down various adds, and save your Time Warp for Phase Three when everyone is giant and you get to DPS a giant squid. The whole party is taking some serious AoE damage at this point so your healer will appreciate any reprieve you can give them. Kill the giant squid before it kills you! 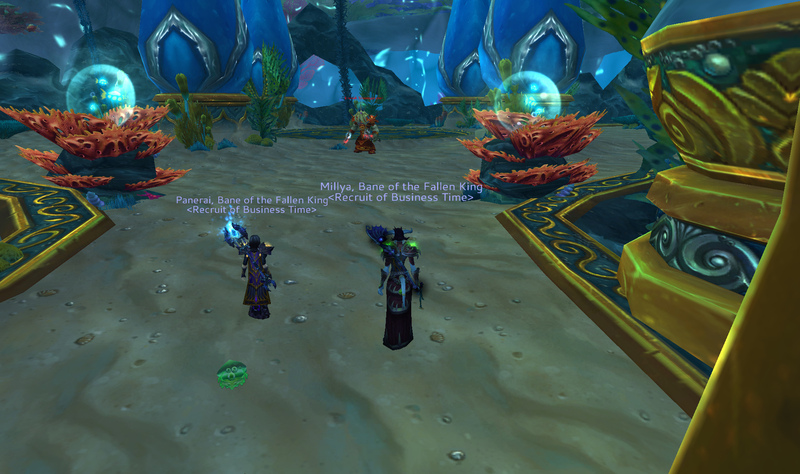 So that’s BRC and Throne of the Tides for you. Do you have any tips or tricks I missed? Feel free to comment and I’ll add them! I’m only one mage, after all. I can’t think of everything. Expect the next parts to be coming soon!